PEARL HARBOR 65TH: The 65th anniversary of the attack on Pearl Harbor was observed by veterans and their families visiting the Arizona Memorial yesterday. 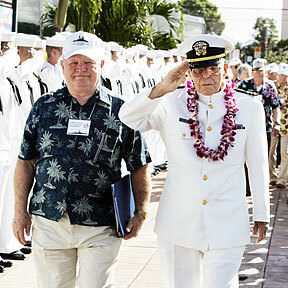 Attendees included seven survivors from the USS Arizona. Bob Lovell, left, and retired Lt. Cmdr. Joe Langdell, 92, walked toward the memorial.